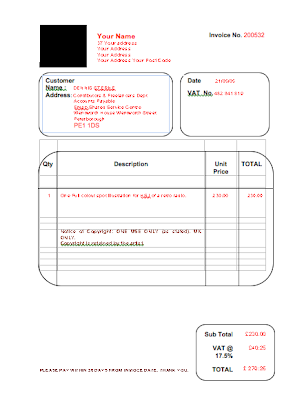 Here is a screen shot of a simple invoice created in word. I'm sure you could create a much better design than this yourselves but it will do for now. You can download the Word document from the 3rd Year Moodle site in the Professional Practice Section. Feel free to edit your copy and add an image or logo in the black square.